In the United States, Patriot Day occurs on September 11 of each year, designated in memory of the 2,977 killed in the September 11, 2001 attacks. Most Americans who were alive during the events refer to the day as “Nine-Eleven (9/11)”, “September Eleventh“, or some variation thereof. Initially, the day was called the Prayer and Remembrance for the Victims of the Terrorist Attacks on September 11, 2001. U.S. House of Representatives Joint Resolution 71 was approved by a vote of 407–0 on October 25, 2001. It requested that the Presidentdesignate September 11 of each year as “Patriot Day”. President George W. Bush signed the resolution into law on December 18, 2001 (asPublic Law 107-89). It is a discretionary day of remembrance. On September 4, 2002, President Bush used his authority created by the resolution and proclaimed September 11, 2002 as Patriot Day. On this day, the President directs that the American flag be flown at half-staff at individual American homes, at the White House, and on allU.S. government buildings and establishments, home and abroad. The President also asks Americans to observe a moment of silencebeginning at 8:46 A.M. (Eastern Daylight Time), the time the first plane struck the North Tower of the World Trade Center on September 11, 2001. 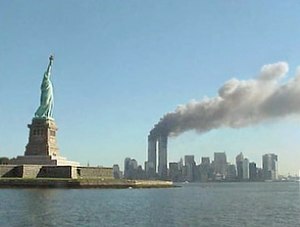 A bill to make September 11 a mourning day was introduced in the U.S. House on October 25, 2001, by Republican Vito Fossella (R-NY) with 22 co-sponsors, among them eleven Democrats and eleven Republicans. It passed the House by a vote of 407–0, with 25 members not voting, and passed the Senate unanimously on November 30. It was signed by President Bush, without ceremony, on December 18 as Public Law No. 107-89. This entry was posted in Random thoughts and tagged Michael R. McNulty, New York City, Patriot Day, September 11 2001, September 11 attacks, United States, War on Terrorism, World Trade Center. Bookmark the permalink.